Blog » News & Events » Sage One is hiring! Following our rapid growth last year (from 6,100 paying customers to 21,000 in 12 months), Sage One is going global with big plans for 2014 and beyond! Our Sage One online accounts and payroll service is built on a single product platform that enables us to build a localised version for any country, rapidly and with full legislative compliance. (See our blog Sage One International: #SageOneWorld). 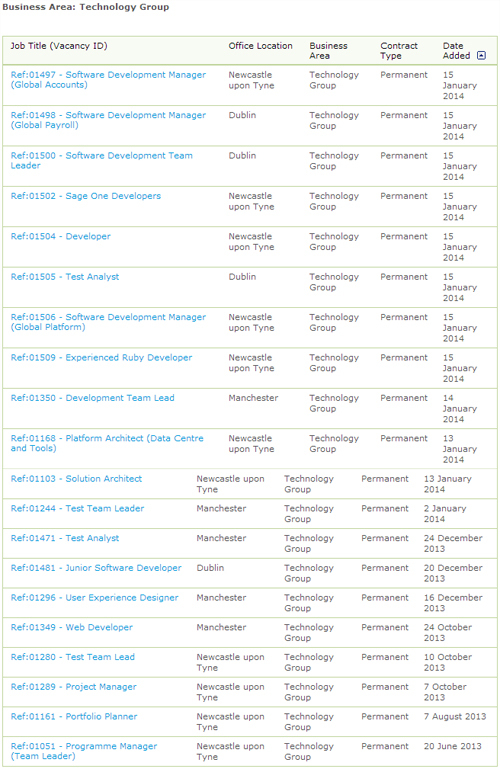 To help us achieve our ambitious growth plans for the coming year we’re now looking to bring in even more fantastic developers, architects, analysts, managers and more to our development teams in Newcastle, Manchester and Dublin (see screenshot below). To see the latest list of vacancies, please visit www.sage.co.uk/careers, go to ‘Vacancies and events’ and choose ‘Technology Group’ in the Business Area. We’d also be grateful if you could help share this information through your networks, both online and offline. Thank you!